We specialize in rubber cork coverings for production, print, rolling and cutting of paper, foil and other bendable materials. It is the simplest and the least expensive way to decrease the skid and tension on the material and increase peripheral strength and stability. 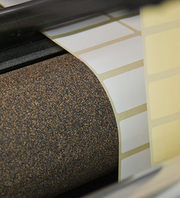 Self-adhesive rubber cork tapes are a great roller coating in printers, laminators, cutter etc. Use of rubber cork covering increases the friction between the roller and the material. If you have any doubts whether our product will be a right fit you’re your purposes, do not hesitate and contact us now! Our vast experience and a number of satisfied customers from many lines of business will let us evaluate if rubber cork covering tape will fulfill your expectations. You are always welcome to use our knowledge and professional guidance not only when placing an order, but also during the installation and further usage of the product. • winding the paper and laminates • flexoprinting • and many more! If the standard tape dimension does not suit your needs please contact us, we can prepare an offer tailored to your individual preferences. Prices negotiable when purchasing large quantities of tape.